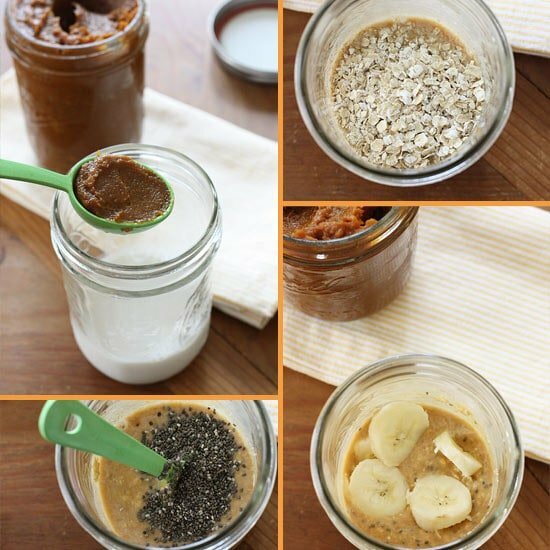 Pumpkin spiced overnight oats with pumpkin butter, banana, chia and spice in a jar (no cooking required!) I know what I’ll be eating for breakfast every morning for the next few weeks. I’ve been eating overnight oats in a jar all summer, it’s perfect to make the night before and eat on a busy weekday or even to bring to work. A few weeks ago someone emailed me about making a pumpkin version which I thought would be perfect for the Fall. This weekend I whipped up a half batch up pumpkin butter (aka- pumpkin heaven on a spoon) and I stirred it into my oats along with chia, bananas and pepitas (pumpkin seeds) and it was delightful! If you like your oats a little sweeter, you add a few drops of stevia, honey or maple, but for me it was just right. Pumpkin season’s back which prompted me to create a Pinterest board called Pumpkin Madness for all my pumpkin recipes. If you’re pumpkin obsessed, you’ll want to follow this board! I also have them all in the recipe index, which you can see here. *For gluten-free be sure to use gluten free oats. Combine the oats and 1/2 cup of the milk in a jar. Stir in the pumpkin butter, chia seeds and spices. Add banana, cover jar, shake and refrigerate overnight. The next morning remove from the refrigerator and let it sit on the counter 30 minutes to take out the chill (or you can microwave a few seconds if you wish). Stir in the remaining milk, sprinkle with a little cinnamon and pumpkin spice and top with pepitas. Enjoy! How long can they be stored in the fridge for? I’d like to make enough jars for the whole week. 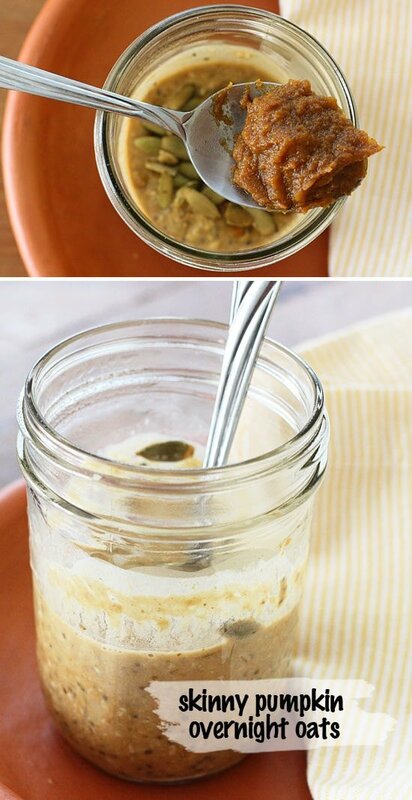 Made your pumpkin butter two nights ago and used it for these overnight oats and all I have to say is WOW.. so delicious ! definitely going to repeat this recipe lots more ! Pumpkin in a jar, is that legal? How long does this last in the fridge? Can I make it in advance for the week or is it best to make fresh every night? Best to make it the night before. I have been having this for breakfast for a few weeks now and its so incredible. 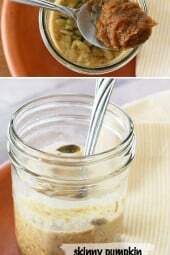 I mash up the banana more like the original Skinnytaste overnight oats with chia seeds recipe. You cannot see any browning through the orange hue from the pumpkin butter. I eat it for breakfast for 2 days with toasted pecans or almonds. Thank you!!!!!! My children are all fussy eaters, but when I served this together with peaches and celery, they loved it! Thanks so much! Hi Gina! I tried this with apples and peach, and they taste absolutely delicious! I didn't even have to use low-cal sweeteners! Thanks for sharing your recipe. Can this be eaten by people with diabetes? My dad is diagnosed having a kind of this disease and, I wanted to make this for him. yes, this would be a wonderful dish for someone who is has diabetes by just substituting 2 Tbsp pumpkin puree, 1 tsp Splenda brown sugar & 1 tsp cinnamon for the pumpkin butter. Also, the cinnamon & chia seeds are known to help control blood sugar. Since you count your carbs intake instead of sugar, oatmeal only has 15 gr with both the unsweetened almond milk & splenda brown sugar with less than 1 gr of carbs. I would leave out the bananas since they are high in carbs & calories unless your Uncle is low on potassium. I love overnight oats, and was wondering if anyone has tried heating them up in the morning for a warm breakfast treat? I've been tempted to try popping my breakfast in the microwave the last few days but I'm a little worried I'll ruin it!? Sure it's good warm too. LOVED IT! I kept it simple and only used milk, oatmeal and the pumpkin butter which has become a staple in my house! and it was more of an overnight oatmeal in a tupperware LOL, it was soooo good I'm making it again tonight but now for my son and husband as well 😉 LOVE SKINNYTASTE!!! funny question.. can we could chia, flax, etc in our 'healthy checks' of 2 tsp of oil a day? Do you think it would still be good if I used regular milk instead of almond? THis sounds delicious! 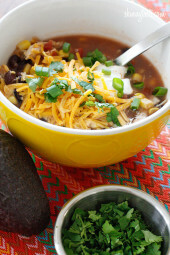 I have tried this recipe and it is delicious and so EASY. 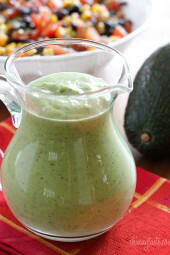 This is one of the recipes on this site that I've used and have not had to make any adjustments. I also like the suggestions and variations in the comments area. I also don't add the additional milk like others. I did it the first time and it was very watery. I like my oatmeal thick. My friend, Julie, and I were running and she was telling me about this recipe. I had never heard of overnight oats. She took me to the store to get the ingredients. I have been making it every morning since. I LOVE, LOVE IT!!! I am a pumpkin fanatic so this is perfect. It's also great because you make it the night before. Somehow my kids always get fed first thing in the morning, but I wasn't. No longer. Thank you! Yet again, another hit out of the park! I made these last night for breakfast for my husband and I this morning. Needless to say, there are more in the fridge for tomorrow! I've added a little more banana for tomorrow (we love bananas! ), but just awesome! I love that he has started doing WW with me, and recipes like this make him love it even more. Hats off and keep it up! Finally got around to making this an I'm eating it right now. Yes, it is delicious. I've been eating the summer version a few times a week and couldn't wait to try this one. Didn't have the pumpkin seeds, so I used black walnuts. Thanks for all your wonderful recipes and tips. I will admit I was skeptical of the overnight oat concept when I stumbled across this recipe, but it is DELICIOUS! Thank you! Tried this last night and loved it. I forgot the extras this morning and didn't miss them. I like my oatmeal on the thick side, plus I thought it tasted a little like cookie dough (yes I'm one of those people). I'm planning on making it for tomorrow and adding pumpkin seeds to it. This might be a silly question, I know they are called over night oats, but could I make a few batches at a time and have like a week's worth to turn to? some of my nights are crazier then others, and I'm not sure I would always prepare this every night. I love this pumpkin overnight oatmeal. The other overnight oatmeals I have made have been okay but I haven't really liked them…this one I love! I use skim milk instead of almond milk and I left out the banana and pumpkin seeds. Very yummy!! I made these last night (I almost feel guilty saying that because there was no work required!) and they turned out great. I've never been a big fan of oatmeal but this might just convert me. Thanks for the great recipe! What's the difference (if any) between quick oats and regular rolled oats? All we have is rolled oats. I have everything to make this except for the pumpkin pie spice. Any suggestions to make this with another spice to be used for the butter? How far in advance do you think these could be made? I was thinking of maybe making a few days worth of breakfast all at once, but not if they get gross after sitting in the fridge too long! Thanks! This is my new absolute favorite! First time trying overnight oats and already so excited about the possibilities…but boy do I love pumpkin. Yum! And, with going for more unprocessed foods in my diet, this fits perfectly! Thank you again Gina for making my life taste better! 3) I lovingly mixed up this recipe last night, deciding to skip the banana. This morning, it was lovely, not too sweet and smelled amazing. I nuked my for a minute and it got even thicker, which I LOVE. Truly the BEST oatmeal I have ever EVER had! Addiction begins here. So happy you loved it!!! Just ate my second jar today! So yummy… I might leave off the topping tomorrow though 'cause this stuff is really filling! Well was drooling over the Pumpkin overnight oatmeal recipe but…..no pumpkin butter so this afternoon made up 1/2 a batch of that (already shared some, might be sorry as it was mighty good)I used only 1/3 cup of brown sugar (for 1/2 a batch)very sweet still. I just made the overnight Pumpkin oatmeal using my homemade pumpkin butter now I am off to bed so I can get up early and try it can hardly wait for morning! Has anyone ever tried it with steel cut oats? Yes, tried with Trader Joe's quick cooking steel cut oats – delicious. I am not a fan of cinammon. 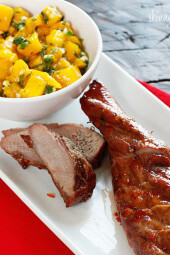 Any ideas on what I could use in place of cinammon for this recipe and for the pumpkin butter? You can leave it out and use more pumpkin spice only, maybe some nutmeg! Great, I tend to like my oatmeal thinner. This is sooooo delicious!!! I am eating this right now and had to post a comment! I love your blog Gina, I make something from you're site almost every day.. Thank you so much for making eating right easy and fun!!! Are the directions supposed to be add 1/2 of the milk, and not 1/2 cup of the milk? You only call for 1/2 cup of almond milk in the ingredients list. The additional milk is with the toppings. I use regular milk in the overnight oats all the time and it tastes great! I'm guessing the almond milk is probably lower in points? Yes, it's lower but you can use whatever milk you like. can I make this with real milk? or is there something special about almond milk that works with the oats? Any milk is fine, I just like almond milk. Ok, I have a crazy idea….. one of my go-to breakfasts in winter is a baked sweet potato with pumpkin butter. I'm wondering if in place of the banana, part of a left over baked sweet potato could be used. I'll probably try it that way. I made the pumpkin butter and overnight pumpkin oats yesterday. I LOVED the pumpkin butter! The issue that I had with the oats is that it was pretty soupy this morning and tasted a little mushy. I was wondering if this the recipe is supposed to be like that or did I make a mistake? I was expecting more of an oatmeal consistency. Thanks! I personally like it like that, if you want it thicker, use less milk. When you first posted about overnight oats, I wondered about a pumkpkin one, hadn't gotten around to thinking up my own. I knew you would! I just had it this morning and it was sublime. My husband and I have been eating overnight oats pretty much every morning since you first posted. Delicious and so versatile! Next up, . . . apple cinnamon, cranberries . . . maybe?? Yes!! So glad you liked it! I made the summer version of this and the texture came out really mushy. i don't know if I didn't something wrong or not. I can't eat Chia seed should i add more oats to thinken it up? Thanks. Yes, add more oats if you want it thicker, or less milk. How many nights can you keep this? I was thinking about making a few for the week on Sunday but was wondering if it will hold up over 2 or 3 nights. Thanks!! I've only had it overnight, I suppose 2 nights would be ok.
Can you buy pumpkin butter anywhere? Thanks! I make it, I linked to the recipe. Trader Joes has a decent Pumpkin Butter if you're lazy. Trader Joe’s pumpkin butter is more points, though. I bought the Trader Joe's pumpkin butter for $2.29 a jar. The raw ingrediants to make the pumpking butter are $5-$10 plus your time. Better off just buying the TJ's jar. Gina, do you know what the pointsplus would be without the topping? Thanks! I'm looking forward to trying this! what are chia seeds? Can you omit those? Sure, omit or use flax seeds. awesome! Thanks!! Definitely going to try this out…LOVE me some pumpkin butter!! What size jar do you use for this? It should hold about 2 cups. Apple oats with cinnamon would be wonderful, I would top it with walnuts or pecans. Where does one find pumpkin puree or pumpkin butter? I linked to the pumpkin butter recipe. It uses canned pumpkin. Can you use regular oats, or does it have to be quick oats? I'm excited! I've been doing the overnight oatmeal for about a month. Ready to try the pumpkin flavor! I don't think I'll ever cook oatmeal again!! Brilliant! Can't wait to try it. I've been eating your oats in a jar nearly every morning since you posted the original recipe. I sometimes mix cherry jam in mine if I'm out of frozen fruit. Love the stuff, and I will be doing this pumpkin one very soon (maybe tonight). Off to re-look at your mexican street corn recipe. Any recommendations for using steel cut oats in a recipe like this? Not sure, haven't tried it with steel cut oats. The trick is grinding up the steel cut oats in a food processor or blender. Just a few pulses is all it takes. It totally works! Yes please! I'm ready for pumpkin anything!